Art collectors and museums all over the world adorn themselves with his works. The church is thrilled, too. But many fellow artists consider Triegel a reactionary artist. Because his kinsmen by choice are especially artists of the Italian Renaissance like Raffael or Leonardo. He masters the painting techniques of the old masters like no one else, like the technique of multiple layers of oil glazes witz which he produces virtuous lighting and shadow effects. He does not produce paintings on the assembly line. His works take a lot of time. His studio at the Baumwollspinnerei (former cotton factory) in Leipzig, where a lot of contemporary artist like Neo Rauch work as well, is filled with meters high canvas. He comes here every day to work on his painting. Eight hours. Through painting Triegel deals with the world around him. With paintings which seem to be well-know at first sight, and which disclose only at second sight the doubts of our times. By looking deeper into his works the viewers gaze seamlessly slides into the present. He is world famous since he portrayed the pope. Michael Triegel was born in 1968 in Thuringia and grew up in the GDR as an atheist. He studied in Leipzig at the famous Academy for Visual Arts in Leipzig. The film accompanies Michael Triegel on a trip to rome, to his artistic sources of inspiration. 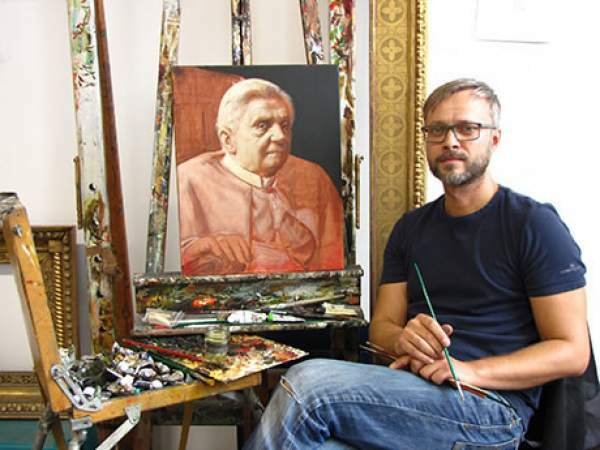 It takes the viewer to the places of his childhood, Erfurt and Weimar and shows the artist in conversation with representatives of the church, art collectors and especially while painting. The film discloses the secrets of his work and discovers a down-to-earth man.